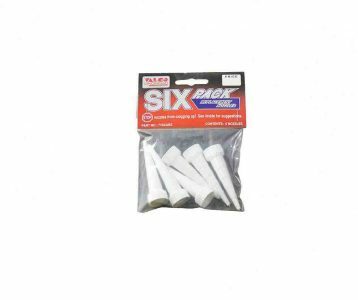 Use the replacement nozzles in Valco’s six-pack to keep material good as new. These nozzles fit all Valco tubes of adhesives and sealants, or any tube with #20 size threads. In addition to keeping your material workable, replacement nozzles can be cut to different sizes and shapes for various applications. To slow down the curing process of silicone, place an uncut replacement nozzle over the used nozzle. This slows the silicone curing process. If the silicone does cure in the nozzle, remove the nozzle and replace it with a new nozzle when ready to use. After the silicone has cured completely, use a pair of needle-nosed pliers to remove the hardened core and your nozzle is once again ready for use. Six Pack Replacement Nozzles will be added to Cart!